Nan Hauser shares footage of an encounter in which a humpback whale nudged her with its head and shielded her with a fin. The way Nan Hauser figured, she was either going to film a miraculous encounter between herself and a 25-ton humpback whale or document her own death. “I’ve always said I’d be killed by a whale,” said Hauser, a renowned marine biologist who travels all over the world and resides in Brunswick. She was only half-kidding. “If someone told me the story, I wouldn’t believe it,” she said. Because in her story, there’s also a shark that was capable of killing her. The encounter happened in October, in waters off the Cook Islands in the South Pacific. 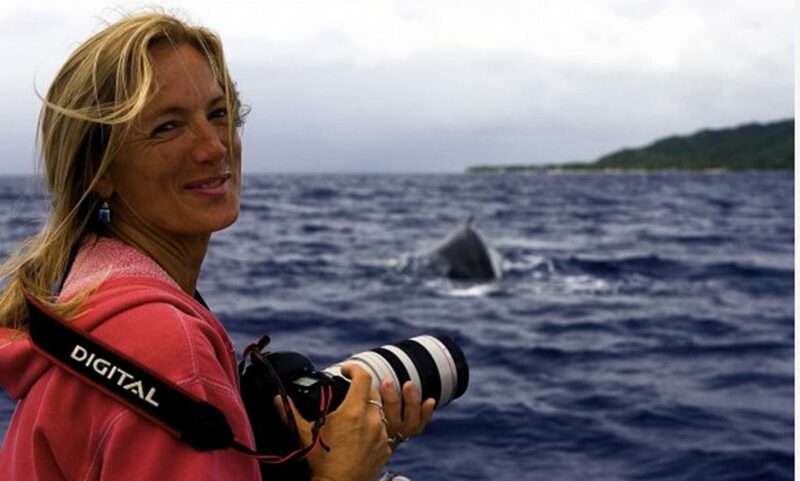 Hauser, 63, accompanied by other researchers and a documentary filmmaker, was diving to search for whales, something she had done dozens, maybe hundreds, of times before. She spotted a humpback and swam toward it. She knew not to touch the creature and was momentarily paralyzed when it got close to her. Then the animal started to nudge her, almost push her with its head, in the water. At some points, the whale shielded her with its pectoral fin. “It was trying to be gentle, but this is a 50,000-pound mammal,” said Hauser, who is president of the Center for Cetacean Research and Conservation, which documents behaviors and patterns of large sea mammals, especially humpback whales. She’s been featured in numerous films aired on TV channels such as Animal Planet, Discovery Channel, National Geographic and Smithsonian. Not knowing what was happening, and not wanting to risk angering the whale, Hauser simply stared at the animal and tried not to make sudden movements. For 10 tense minutes, the whale moved Hauser through the water. Her research companions watched what was happening but didn’t really know what to do, Hauser said. They even turned off the drone they were using to film footage so they wouldn’t accidentally have video of her being mauled to death. 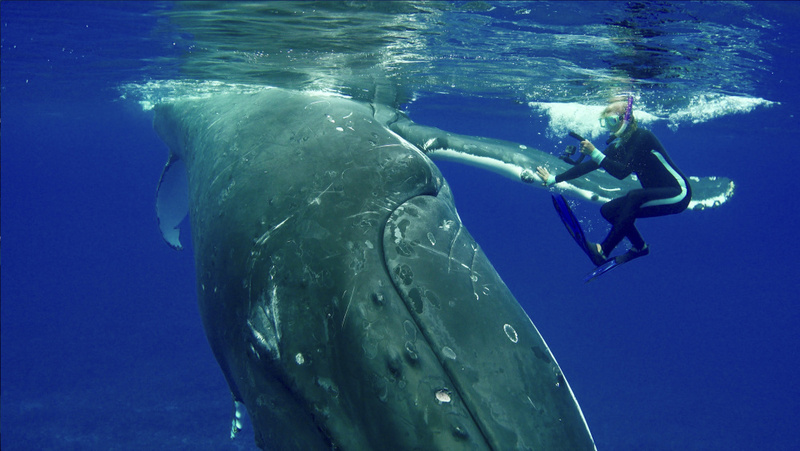 When marine biologist Nan Hauser approached a 25-ton humpback whale in the South Pacific, it nudged her through the water for about 10 minutes and at one point lifted her to the surface with its flipper. She thinks it was trying to protect her from a large tiger shark nearby. When she was close enough to the research boat, Hauser moved away from the whale with trepidation. She spun around to look back, and that’s when she saw it – a massive tiger shark. The whale may have just saved her. National Geographic has reported that tiger sharks are responsible for more recorded attacks on humans than any shark except the great white. Hauser posted the video footage from her encounter, most of it shot underwater, Monday morning. Since then her phone has been ringing incessantly. She said she’s been happy to oblige each interview request. 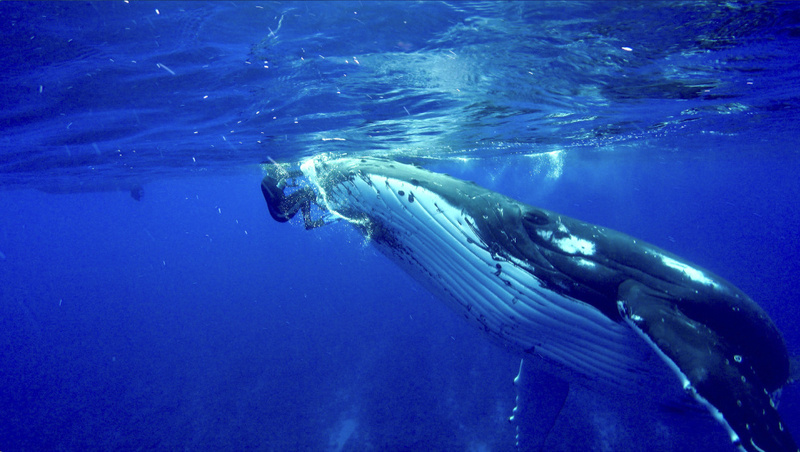 Brunswick biologist Nan Hauser filmed a video of her encounter with a humpback whale in waters off the Cook Islands in the South Pacific that she says may have saved her life. “I’ll admit, I’ve been studying whales for 28 years and I’ve published 56 papers, I think. I’ve never heard of that,” Hauser said. Even after she swam away from the whale and started to climb onto the boat, the creature surfaced again about 20 feet away. “It was checking on me, making sure I was safe,” she said. Hauser, who raised a family and worked as a nurse before embarking fully on her current career, said she’s had numerous close encounters with whales. She knew enough to keep her distance and said she was trying to get away from it at several points. Now she’s glad she didn’t. The tiger shark was at least 15 feet long, she estimated. Bigger than any she’d ever seen. Hauser suffered some bruises and scratches from her impromptu swim with the whale but was otherwise unscathed. As the footage started to make its way around social media Monday, Andrew Pershing, chief scientific officer at the Gulf of Maine Marine Research Institute, was among those who watched. He was astounded. “To have something like that happen with cameras in the water, that’s really extraordinary,” he said. Pershing said the encounter underscores how much there remains to learn about whales, but also highlights the risk in doing the type of research Hauser does. He said he doesn’t know Hauser personally, but her reputation in the field is exemplary. James Sulikowski, a marine biologist and professor at the University of New England who has studied tiger sharks, admitted that Hauser had “an awesome experience.” He’s not convinced, though, that the whale saved her life. Hauser acknowledged as much, but she still believes the whale was protecting her. For that she’s grateful. A few weeks ago, after returning home to frigid temperatures and frozen pipes at her Brunswick home, she visited with family and let her bruised body mend. In less than two weeks, though, she’ll head back to the South Pacific.